Hand knitted Frozen inspired snowflake hat. Suitable for children aged roughly 5-10 years. All items are hand made to order. Got a question? Message Harriet-Rose Crafts. As item is custom made, please allow up to two weeks for delivery. Should you wish your item to be tracked in the post please select the Signed For option. No responsibility can be taken for items getting lost in normal 1st or 2nd class post. If item is customised, returns will only be accepted if the item is damaged. Hand painted and hand decorated Mr and Mrs wooden freestanding lettering. Ideal wedding gift or even for display on your top table! Lettering is normally in white but please do contact me should you..
Handcrafted box frame picture containing a vintage style pressed flower picture with attached 3D butterfly design. All flowers are pressed by myself for at least three months prior to use. 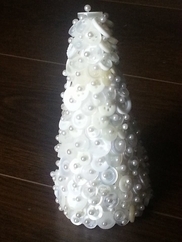 Pictures can..
Handcrafted button tree available in a variety of different colours. Contains over 200 buttons and pearl pins. Fabulous table centrepieces! Can also be made in different sizes - please contact for further..
Canvas hand painted picture depicting button art flowers and a 3D effect butterfly. Button flowers can be in the colour of your choice (please choose from the drop down box or contact me using the message..
Hand painted and hand decorated wooden freestanding initial letter. Colours are listed but please do contact me if the colour of your choice is not listed. Choose your initial required from the drop down.. Single hand knitted soft toy Clanger. Available in pink clothing or yellow/cream clothing. All items are hand made to order. Hand knitted mini festive stockings, ideal for chocolates, candy canes, finger puppets, etc. Should you wish your stocking to come ready filled please contact me via the message service and we can discuss..
Hand knitted football theme colours miniature stockings, ideal for containing chocolates, candy canes, pin badges, etc. If you'd like your stocking ready filled, please discuss me via the message service..
Ready to hang canvas button art picture featuring a wooden hand painted tree with falling 'leaves'. 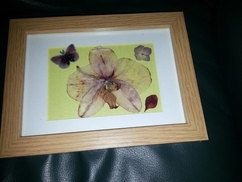 All pictures are made to order and each is one of a kind. Choose your colour scheme from the drop..
Ready to hang canvas featuring hand painted wooden moon with button design and the lovely plaque underneath displaying the words 'Love you to the moon and back'. All items are made to order and are therefore..
Ready to hang canvas featuring hand painted button art heart in the colour of your choice. Please choose from the drop down list or contact me via the message service to discuss your requirements. 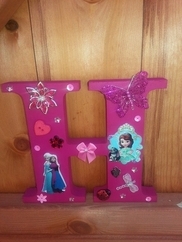 Plaque..
Ready to hang canvas featuring a hand painted crown decorated in sequins and buttons with plaque containing the word 'Princess'. All items are hand made to order so are one of a kind. Please choose.. Box frame 6 x 6 inch picture with hand painted frame featuring button art hand painted wooden duck. Please choose your colour preference from the drop down list or contact me via the message service..
Hand painted box frame 6 x 6 inch picture with a wooden dinosaur decorated with buttons and sequins. Please choose your colour from the drop down list or contact me via the message service to discuss..
Hand painted 6 x 6 inch box frame picture featuring a cute wooden baby elephant hand decorated with buttons and other embellishments. Please choose your colour from the drop down box or contact me via..
Hand painted 6 x 6 inch box frame picture featuring a wooden hand decorated butterfly in the colour of your choice - just select from the drop down box or contact me via the message service to discuss.. 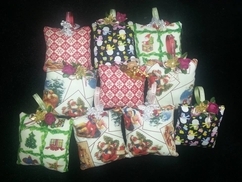 Handmade hand sewn Christmas hanging pillow decorations in a variety of different fabrics, all decorated with a lovely Christmas style embellishment and a hanging ribbon. Please note: All pillows are..
A hand knitted soft toy Father Christmas. All items are hand made to order. Hand knitted set of three Clangers soft toys. All items are hand made to order. 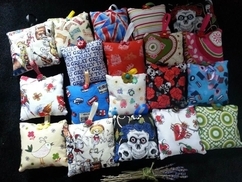 Individual Clangers sold on other listing. 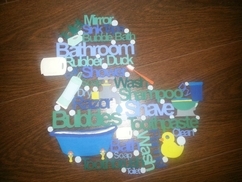 Wooden bathroom hanging wall art in the shape of a duck, hand painted to your own colour preference. Please choose the colour from the drop down box or contact me using the message button should you wish..
A hand knitted sparkly blue wool soft toy elephant. All items are hand made to order. Please contact me via the message service should you require a different colour. Hand knitted children's hat with teddy bear motif. Please select your colour from the drop down box or contact me via the message service with any other requests. All items are hand made to order. A hand knitted soft toy lion. All items are hand made to order. A hand knitted soft toy grey elephant. All items are hand made to order. Should you require a different colour please contact me via the message service. A hand knitted soft toy koala bear. All items are hand made to order. A hand knitted soft toy panda bear. All items are hand made to order.